Canada and Australia may be thousands of kilometres apart, but a new study suggests that they were once connected. The research, conducted by Australia’s Curtin University, suggests that northern Australia was connected to northwestern Canada about 1.7 billion years ago. The study found that rocks in Georgetown, Australia, were nearly identical to rocks found in Canada, and the rocks are not found anywhere else in Australia. “Our research shows that about 1.7 billion years ago, Georgetown rocks were deposited into a shallow sea when the region was part of North America,” said PhD student Adam Nordsvan, of Curtin University. Georgetown broke away from North America and collided and joined the Mount Isa region of Northern Australia about 100 million years later. Nordsvan says that this discovery also reveals more about Nuna -also known as the Earth’s first supercontinent. “This was a critical part of global continental reorganisation when almost all continents on Earth assembled to form the supercontinent called Nuna,” said Nordsvan. 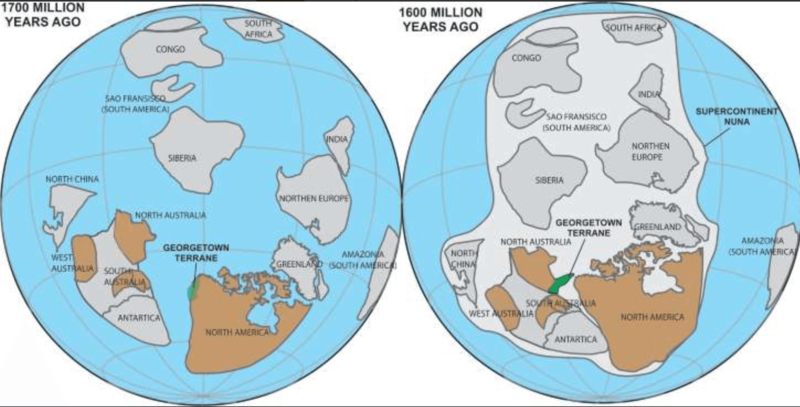 Researchers say that when supercontinent Nuna broke apart nearly 300 million years later, the Georgetown area did not drift away and became a permanent part of Australia. Looks like Canadians are more connected to our Aussie friends than we thought!